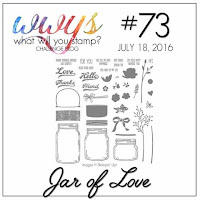 Tina's Crop Shop: WWYS #73 - Jar of Love! WWYS #73 - Jar of Love! Hello! I'm back on my blog.. wow, twice in one day! lol I saw this awesome challenge over at What Will You Stamp? Challenge Blog using the new Jar of Love Stamp Set and couldn't help myself. Oh and I needed to make a Bridal Shower Card and I thought this would work perfectly! So here is my card... I'm LOVING this stamp set! This one started off with an 11" x 4 1/4" piece of Crumb Cake Cardstock that was scored at 5 1/2". I added a piece of 4" x 5 1/4" Pool Party Cardstock that was dry embossed with my Woodgrain embossing folder. After embossing I ran a White Craft Ink stamp pad over the raised area for a little extra dimension. My tag was a My Favorite Things Stitched Tag Die cut out in Whisper White. I used a 1/4" circle punch to punch a hole in the top of the tag. I stamped my Jar on the tag in Pool Party Ink. I stamped the water in Pool Party as well. I cut a piece of a sticky note to mask the threaded section of the jar so I could stamp the stems and leaves directly on the jar in Old Olive Ink. 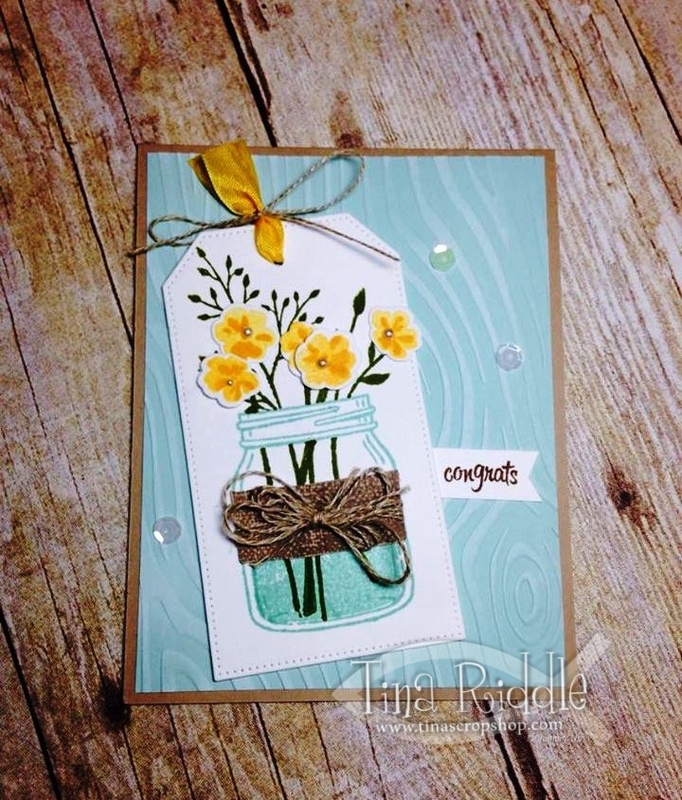 I stamped the flowers in Daffodil Delight Ink onto Whisper White Cardstock. I added the detail in Crushed Curry Ink and then cut them out with the coordinationing Jar Framelits. I attached them to my tag with glue dots and added small pearls in the center. My burlap layer was stamped with Tip Top Taupe Ink onto Crumb Cake Cardstock and then handcut. I ran some Linen Thread around the Faux Burlap layer three times and made a messy bow for the front of it. I then attached it to the front of the jar with Fast Fuse. The "congrats" sentiment is from the Thoughtful Banners stamp set and was stamped in Soft Suede onto Whisper White Cardstock. I banner cut the end and adhered it to my Pool Party layer with Fast Fuse. I ran some yellow seam binding through the tag and then tied a piece of Linen thread into a bow on it. I attached my tag at an angle with Dimensionals. Last but not least I added three white sequins to the card front. SIP Challenge #58 - Sketch!! SIP Challenge #57 - Black and White! SIP Challenge #56 Christmas in July! ICS Blog Hop Introducing 2016-2018 In Colors! SIP Challenge #55 - Sketch Challenge!